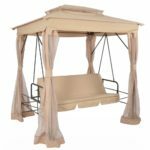 It would feel incomplete if your garden was missing a 3 seater garden swing chair, these cosy garden swing sofas makes your garden look a little bit more relaxing at an affordable cost. Ideal for smaller gardens too as the length and width dimensions are about the same as a free standing hammock, but you can seat 3 people whereas a hammock is only for one person. A 3 seater garden swing chair however is a permanent fixture, so it can’t be collapsed and folded up in less than a minute like you would with a folding sun lounger or deck chair. That being said, those two items would be good alternatives if you didn’t want to leave garden furniture out all year round. Another stylish but more expensive alternative would be to buy a hanging swing chair which can be used indoors and outdoors! If you have enough space in your garden for your 3 seat swing chair then unless you’re willing to go through the hassle of dismantling it for the seasons it’s not in use, cover it with the relevant heavy duty waterproof cover to prolong the life of the furniture. 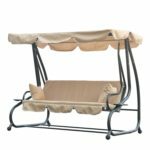 Other than picking the style and colour, there are other factors you may need to take into account when choosing the best 3 seater garden swing chair. Material – The frame, seat and canopy will usually be constructed from different materials. This will give an indication of how strong and comfortable it’ll be. Wooden swing chairs are usually the strongest as it has the highest maximum load but it also costs the most. Canopy tilt – Canopy can tilt at an angle so if you prefer to have less shade then you can simply tilt it to the angle where you can get more sun. That being said, you can even remove the canopy on some of the swing chairs. 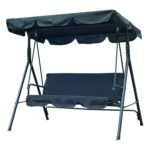 Converts into bed – When the back is folded out it becomes a bed which is perfect if you want the swing chair to yourself and want to take a nap or just relax. Drinks holder – A handy addition to have because when you’re on the swing chair, most of the time you’ll be having a drink but with no drink holder your drink will probably not be within reaching distance. 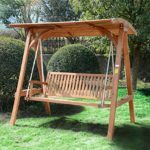 Maximum weight load – Some of these 3 seater garden swings will have a relatively low maximum weight load. The lowest is usually around 200kg and if you have 3 adults sitting on it, the average weight per person can only be 67kg. If the regular users are likely to weigh more than that then consider a model which has a higher maximum weight load. Dimensions – Whether you place the swing chair in the garden, conservatory, on the decking or front porch, you might need to measure the designated area to check to see if it’ll fit. 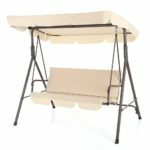 For anyone who’s on the fence on whether they want to buy a garden swing sofa or not, don’t worry as we’ve created a list of pros and cons to help you decide. When assembled it takes up about the same space a sun lounger and free standing hammock. Includes a canopy which some can be tilted or removed. 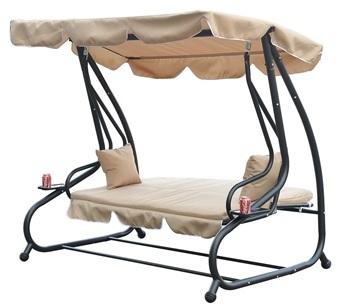 This eliminates having to buy a garden parasol to provide shade for the swing chair. Makes your garden look nice and cosy. Can seat up to 3 people. A permanent fixture so you’ll need to find a home for it, whereas deck chairs can be folded away when it’s not in use.